This card is dedicated to YOU. Yes, YOU. Honestly, you all make my day with your generous comments and by taking the time to enter my little challenges. So thank you. I couldn't resist making another card with the Early Bird Chipboard Shapes from Cosmo Cricket and the yummy papers from October Afternoon's Farm Fresh line. Supplies: Stamp - Hero Arts; Chipboard - Cosmo Cricket; PP - Cosmo Cricket and October Afternoon; sewing machine; labels 1 nestie; button - Papermania. And... to show my appreciation, I've picked a dedicated commenter to send a small token to. And the winner is DAWN. Send me an email Dawn and I'll post something off to NZ!!! These retro cards are really cute. I find the Cosmo Cricket papers to work wonderfully with others retro elements too. 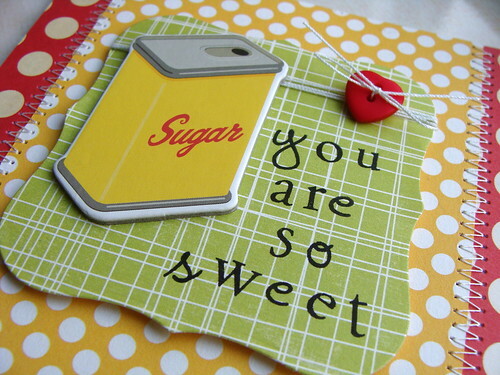 And the card with the sugar container today....I loved it - absolutely charming, delightful and fun. Lucy - I just love, love, LOVE this card and your home made sentiment. This is just too cute! This card is fabulous. 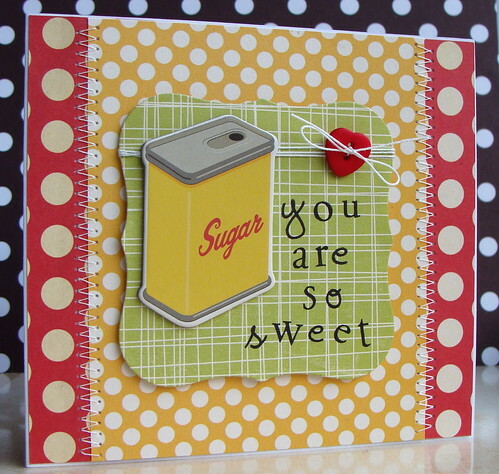 Especially because I have a friend named "Sugar" and she would get a kick out of a card like this. Thanks for the inspiration. super sweet card, Lucy!!! LOVE your signature style now!! lovely!! Lucy - what a delightful surprise... I so enjoy your blog and this is just wonderful. Love the super colours on today's card. Will email my snail mail shortly. Such a cute card Lucy! This is so cute and extra fun!! What a fun card, Lucy! Love the stamped sentiment--I must try that! What a sweet card and a sweet surprise for Dawn! What an adorable card! Love the colours and the retro feel of it. I also wanted to thank you for your sewing video! I think I am going to give it a try!!! Such a cutie of a card, loving that OA paper...love all of their stuff!! What a fun card and a wonderful design. I love that Cosmo Cricket paper. Just giving back the sweetness I get from you. Thanks for sharing your awesome talent! You are SO sweet, Lucy! I got my own copy of Stamp It today!! Love p. 73! YOU rock! Just wanted to let you know I think what you did is sooooo nice! picking a comment without announcing it first and just surprising someone (Good for you, Dawn!) is beautiful! I love this card and all of its cosmo goodness!! !